Apollo 13 was the third manned mission intended to land on the Moon. The craft was launched on April 11, 1970,from the Kennedy Space Center, Florida, but the lunar landing was aborted after an oxygen tank exploded two days later, crippling the Service Module (SM) upon which the Command Module (CM) depended. Despite great hardship caused by limited power, loss of cabin heat, shortage of potable water, and the critical need to jury-rig the carbon dioxide removal system, the crew returned safely to Earth on April 17. Streetcap1 found in NASA's archive an amazing image of an unknown object close to the Apollo 13. See the video below. Further he said "If you save the image to your computer you need to increase the brightness to see the object." So, I saved image 8528, Streetcap1 is talking about, and I also saved the next image nr. 8529 and brightness both images with 'auto adjust colors' and this is how it looks. Original NASA images Nr. 8528 (left) and Nr. 8529 (right). 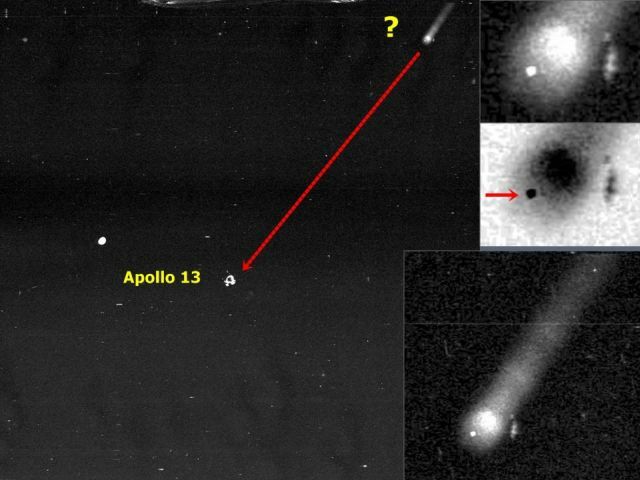 We see some unnatural objects and it looks like they are positioned around the Apollo 13 module. According to Scott Waring it's possible that the alien craft was observing the module in case they needed to offer assistance. But if we are looking at the following image, we see a solid object at the front of a bright object approaching the module and I'm wondering if this unidentified flying object is the real cause of all the malfunctions in the Apollo 13 module. 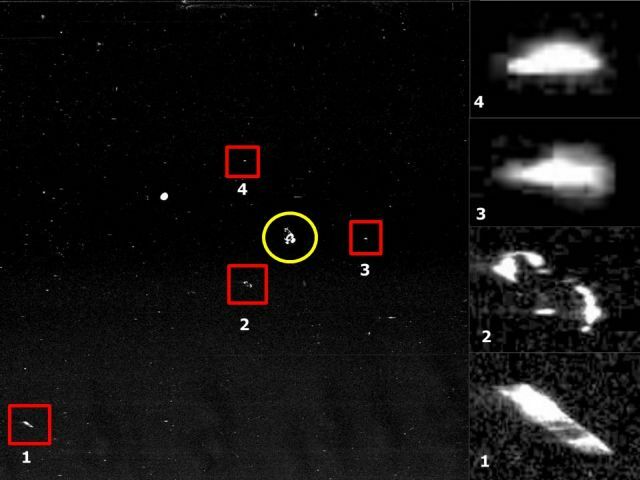 Images taken before and after the numbers 8528 and 8529 also show some strange UFO-like objects. This comment by Scott Waring proves why I don't like his website and prefer this one:…"the alien craft was observing the module in case they needed to offer assistance." Scott jumps to conclusions. Constantly. How can he possibly know its an alien craft? Did he meet the occupants? Was there propulsion and design to the "craft"? What about the possibility that it was part of Apollo 13's own pieces? Some kind of camera anomaly? Something else? Also, how does Scott know that if it was an alien craft, it was there to off assistance? What if it was observing? What if the "craft" actually caused the damage? Scott "Jump to conclusions" Waring speaks his mind without giving any thought or evidence to back it up. His website would be much improved if he simply stuck to the facts. I dont like negativity in these subject matters, where the posters or debaters are concerned. How ever, I do have to agree with your assessment about interpretations. Details and facts should be given as they are, Untarnished. So people can decide for them selves. Then, conjecture or hypothesis can be given, so long as it is stated that it is an opinion, not fact. In the end, nothing should be claimed as conclusive and written in stone, not even when so called PROOF is offered, and seems unshakable. for new data can always bring new light to the bigger picture.